Gibson ES-175DN Model Arch Top Hollow Body Electric Guitar (1956), made in Kalamazoo, Michigan, serial # A-22260, sunburst top, dark back and sides finish, laminated maple body, mahogany neck with rosewood fingerboard, original brown hard shell case. This is a lovely original example of an mid-1950s ES-175DN, the natural-finish version of Gibson's classic "Working Man's" jazz guitar. 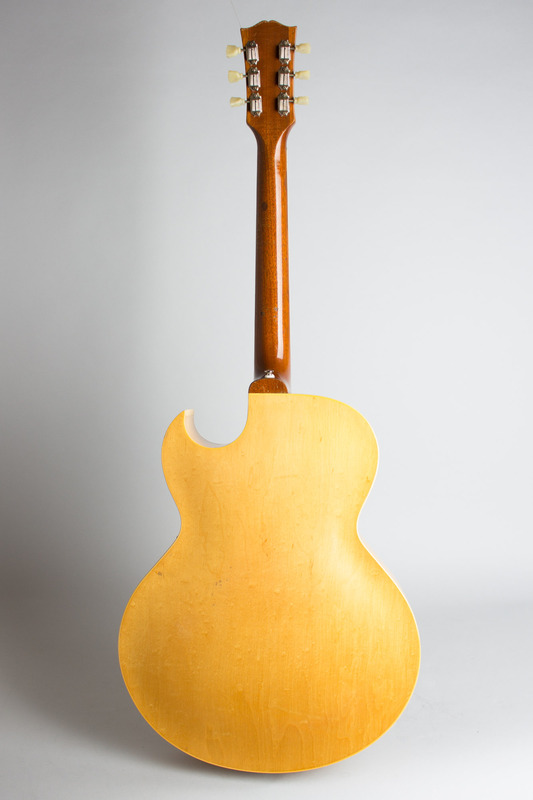 This particular guitar was built when the 175 was already a very successful design, having found immediate acceptance for its combination of great sound and playability at a moderate price. 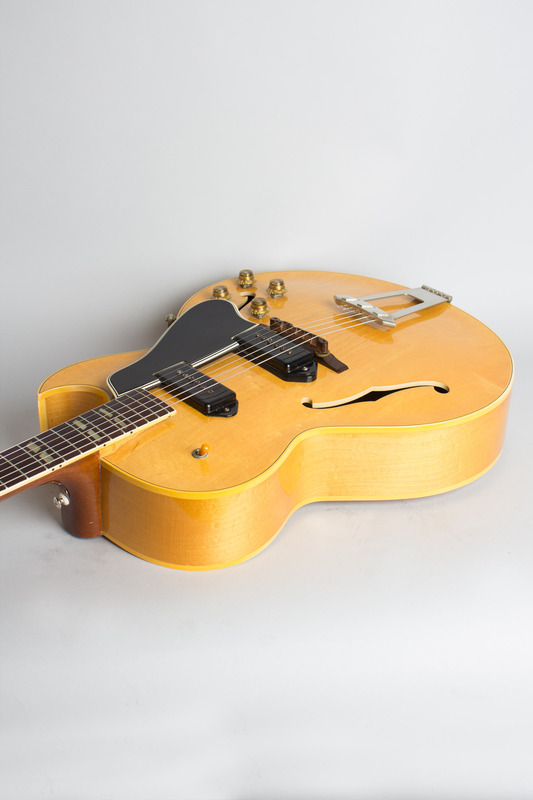 The model debuted in 1949 as a single-pickup guitar; the ES-175D had been added to the line in 1953 with a second pickup at the bridge adding a lot of tonal versatility. 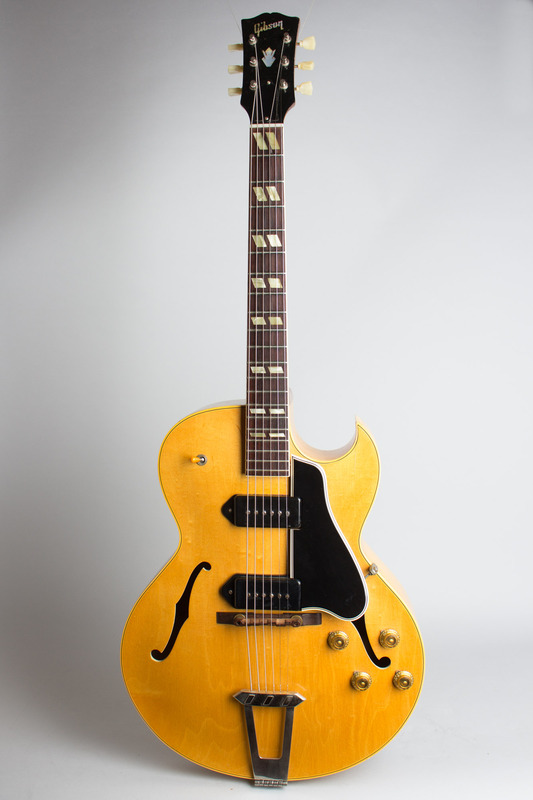 Many jazz players still continued to prefer the original version with the neck PU alone, but blues and rock and roll players appreciated the extra twang potential of the bridge pickup. The other features of both models were the same, the "D" just adding the extra pickup, knobs, and switch to the mix. The natural-finished laminated maple body is triple-bound on the front and single-bound on the back; the neck is single bound with split parallelogram fingerboard inlays. 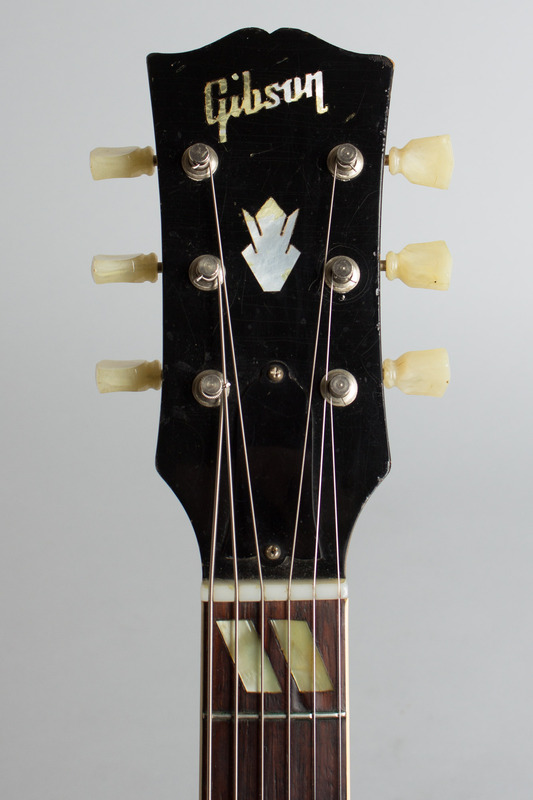 The headstock carries the pearl Gibson logo and crown inlay and Kluson Deluxe tuners with "keystone" buttons. The original hardware includes double P-90 pickups with black plastic "dogear" covers, the standard Gibson rosewood bridge, a 5-ply beveled-edge pickguard, earlier L-7 style tailpiece, and tone and volume controls with amber plastic numbered knobs. 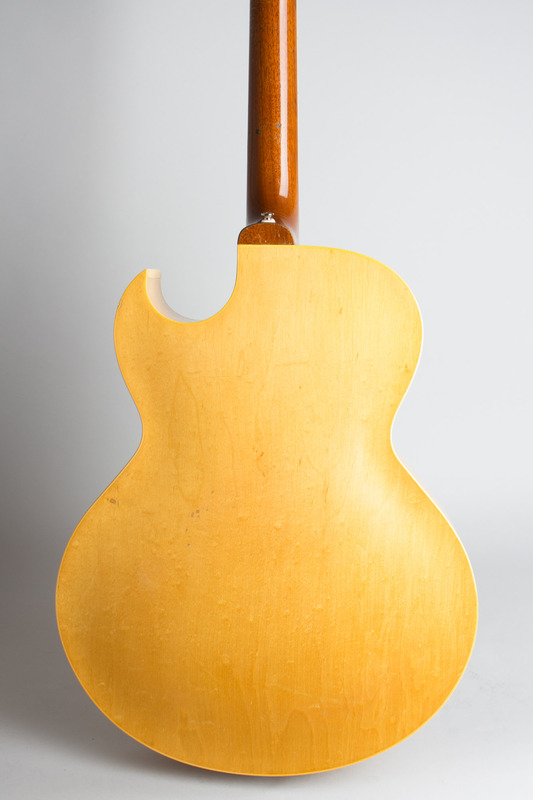 The orange Gibson label bears an "Artist" serial number dating to the end of February 1956, and the coded factory order number V4415-29 reflects the same period. 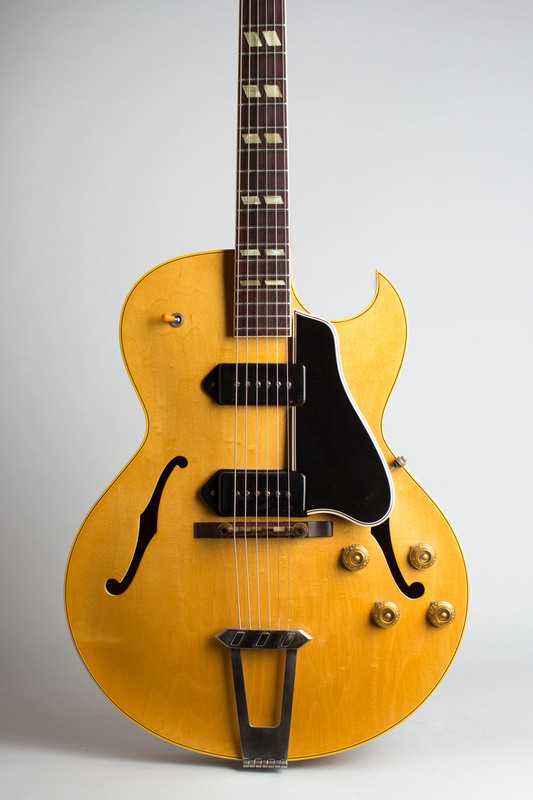 This era's ES-175 has been used by far too many jazz guitar greats to count; the double-pickup examples like this one are also great early rock and roll, rockabilly, and R&B guitars. Overall length is 40 1/2 in. (102.9 cm. ), 16 in. (40.6 cm.) wide at lower bout, and 3 5/16 in. (8.4 cm.) in depth, measured at side of rim. Scale length is 24 3/4 in. (629 mm.). Width of nut is 1 11/16 in. (43 mm.). A nicely original guitar, with some light wear overall. 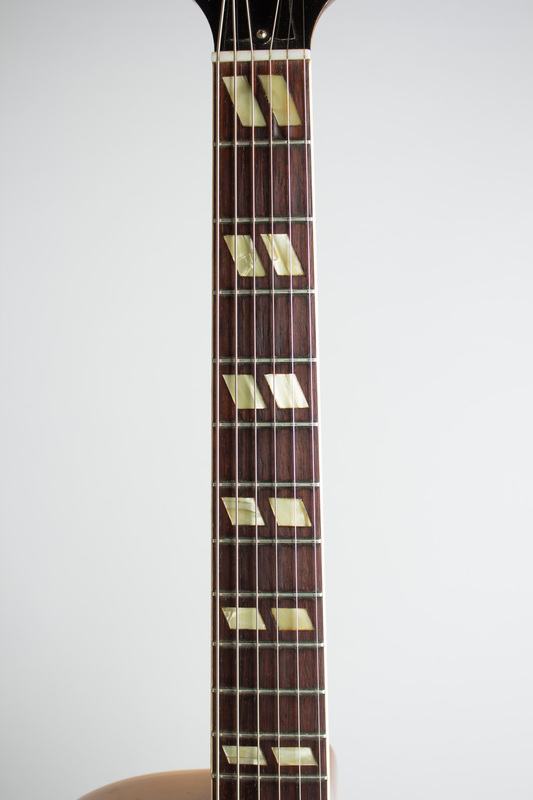 The finish has some light checking and scattered dings and dents, the largest being a thumb mark on the back of the neck behind the third fret. The rear pickup cover has some inexplicable scrape marks on its face. 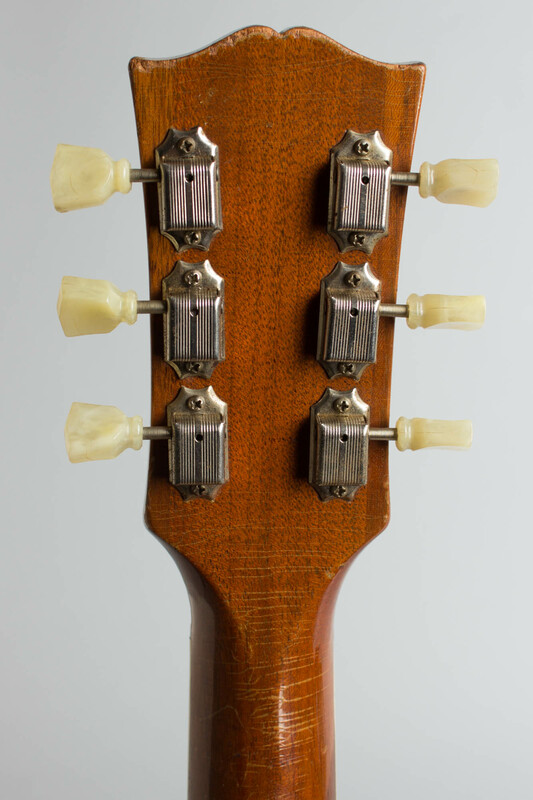 The top edge of the headstock has some worn areas and a chip off the tip of the treble side face. A strap button has been added to the neck heel. The frets are taken down a bit and there is one notable divot under the B string at the first fret that does not affect playability. Overall a very nice example of this Gibson classic, complete in a fine original brown HSC. Excellent Condition.